Fido may have the cutest puppy face and be your best running partner for those sunny Sacramento days, but what if we told you that he could also be bringing pests into your home? It’s true! Dogs and cats are some of our best friends, but they’re capable of bringing various pests into the house. With their thick hair and tendency to explore the outdoors, the chances of your pet carrying pests is extremely high. If you’re nervous that your dog or cat may be bringing pests, today’s blog is for you. We’re going to be touching on some of the pests that your pets could easily bring into your home. Let’s dive right in so that you know what to keep an eye out for. One of the pests that pets are most commonly known for bringing home is fleas. These pests are strongly associated with pests because of their long hair and the common scratching that comes along with them. There are two different types of fleas that your pet could bring home: dog fleas and cat fleas. These fleas will feast on just about any domesticated animal. While it may sound like the fleas are specific to the type of animal that they would be found on, that’s not the case. These pests can be found on all sorts of animals including rabbits, horses, birds, and the like. Though it is uncommon for some of these animals to be infested with fleas, it’s not impossible. Given that pests are passed from one animal to another, you need to be cautious if you find fleas on one of your pests. Fleas don’t fly, but they jump from one host to the next, making them very easy to spread to other animals. For that reason, you should always be cautious of your pet scratching extra when they’ve recently visited a place where other animals are present. Be it the dog park, the veterinarian, or a friend’s house, you should always check your pet’s coat. In the case that you do find fleas on your pet, you should ensure that they are treated. Even small amounts of fleas can lead to large infestations and infections. As soon as a flea finds a host, they are able to lay thousands of eggs in a very short amount of time — this takes fleas from a small problem (literally) to a much larger concern that you need to be cautious of. 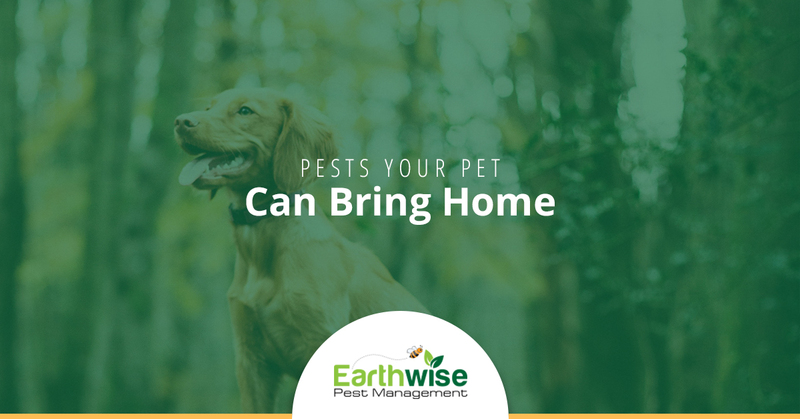 The second most common pest that pets are likely to bring home is ticks. Now, you’ve likely heard about the dangers of ticks because they don’t only host on animals — they host on people too. These pests are often picked up after spending time in the woods or areas with tall trees. Again, these pests are small in size but have a mighty force when they’ve turned into an infestation. Ticks feed on blood, which is one of the many things that makes them a danger to both your pets and yourself. While their feeding status is dangerous in itself, the most dangerous aspect of ticks is that they are capable of carrying both bacteria and disease. When a tick has found a host, they burrow under the skin so that they’re able to reach the blood source and feed. If they go without being seen, a tick can feed off of a blood source for up to a year. The sooner that you recognize the effects of a tick on your pet, the better it is for you to get them taken care of. While it’s very unlikely that you’ll find more than one tick on any given host, it is possible for them to move from one host to the next. The end goal is always to find a host that they can feed off of and survive with. If you notice a problem with ticks in your yard and are dealing with them on a regular basis, it’s good to turn to your local pest control company as quickly as possible. When you’ve found fleas or ticks in your home, you need to make sure that you’ve got a reliable pest control company to turn to. Reach out to the team at Earthwise Pest Management to ensure that a proper inspection is conducted on your property and that you acquire a solution that yields long-term results. We are dedicated to providing Sacramento residents with the guidance that they need, so what are you waiting for? Contact our team today and get your initial consultation scheduled. Let our team members know if there are any questions or inquiries that they can assist you with.